Buying a horse is a grave and ponderous act requiring some forethought it seems to me. Especially when the horse being offered is a large, black Afghan stallion; an alleged Buzkashi mount of note. And more especially when the time and place of one’s introduction to said horse is in the middle of a crowded Kabul market and the seller is a wiry Afghan horse trader dressed all in black: black longi or turban, black shirt, black vest, baggy black pants tucked into shiny leather knee-high Turkoman boots. Consider the act even more ponderous when the horse trader in question looks more than a bit like Genghis Khan. Add, then, to the equation, that I was not looking to buy a horse really, and if I had been in the market for one, that the place to take any horse for a test ride was not on the asphalt-paved main street of Shar-e Nau, the “new city” of suburban Kabul; horses tend not to get good traction on asphalt when shod in steel and are likely to be spooked by the close proximity of all manner of conveyances – motorized and otherwise. Finally, and most importantly, consider that I was not an experienced rider, per se. Surely, I had ridden horses many times and enjoyed the casual saunter and clip-clop of a ride on some bridal path or across a mellow pasture. This ride, on the other hand, turned out to be something altogether different. Mounting this steed was akin to mounting a Ducati superbike. At the time, I believe it was the spring of 1971, there were a number of ferangh, foreign visitors, mostly peripatetic hippies, who, with a hunger for adventure, had decided to buy horses. Some bought starving nags to keep them from the glue works or worse, and some bought retired tanga cart mares. Naturally, word of this interest got out to the traders of these horses and from time to time they would appear at the market called Zarghoona Maidan in Kabul’s Shar-e Nau district to show off their mounts and offer a chance for a ride to the interested and unsuspecting alike. So a group of us had gathered at the entrance to Chicken Street, an odd collection of prospective riders and the owners and the horses surrounded by an ever-growing crowd of onlookers. A German guy called Afghan Ted, who already owned quite a nice horse, accepted a chance to master the black stallion and went off with the owner for a ride toward the Shar-e Nau Park and the gas pumps. They returned a short time later, gleeful, and Ted called out that this would surely be the horse for me. Reluctantly, I accepted the offer and with some assistance from an Afghan man sat atop this huge, tall horse. The owner handed me a short whip, the kind used by Buzkashi players to “encourage” their mounts. This time, the owner and I started east on Shar-e Nau Street, heading to the intersection where the USAID library was located. Traffic of all kinds converged on us: busses, cars, bicycles, and the two-wheeled nag-drawn tangas. Now, to make mention of a peculiarity to some Afghan cities, the streets in this part of Kabul at the time were bordered at the curbs by a deep open concrete channel, or gutter, referred to as the “jooie”. The jooie is basically an open sewer for rainwater and all manner of unmentionable trash and jetsam and is quite deep, say 14–16” by my recollection and a foot or more wide at the mouth. This fact is important to note, and I think the presence of the gutter was not lost on the horse itself as we were suddenly squeezed between a gray and white city bus, the sidewalk and looming open jooie at the corner. 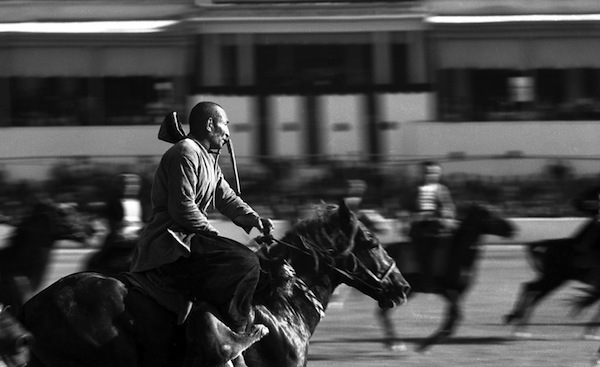 By the time we had reached this point the horse had gained considerable speed and I was literally holding on for my life: whip in my teeth (a la the chapandaz – the buzkashi players), white knuckles clinching the reins, knees pinched tight against the red woolen carpet remnant that served as the saddle. At the last possible moment before we both were about to be tossed headlong into the jooie, the horse, making a life-saving leap, startling the pedestrians who were present and clearing the entire corner, landed in the middle of the intersecting street, hooves splayed out, shoes shedding sparks, pedaling desperately as if he were some cartoon horse on ice, to gain traction on the slick asphalt. When he finally managed to get back in balance and begin to move forward, we catapulted ahead with tremendous velocity. I was now more or less in control of my own body, if not that of the horse. I realized gradually that my abject fear had abated and that I was having an exhilarating time of it! Very quickly we approached the large intersection where still stands The Mustafa Hotel. Thankfully the horse began to slow and in a moment I realized the horse’s owner, Mr. Genghis Khan look-alike, had caught up and was beside me and had taken my mount’s reins in hand. Carefully we crossed the median that divided the street. Genghis handed the reins back to me and at a mere gallop as opposed to a flat out Derby run, we changed direction and returned to the onlookers gathered at Chicken Street. The entire episode might have lasted five or six minutes. The crowd still lingered as we returned and Genghis loudly related the details of our outing to the laughing Afghan men. I dismounted my horse and stood, still shaking, among the tourists and Afghans, Afghan Ted revealing a knowing snicker. Then oddly, someone clapped me on the back and another shook my hand furiously. “What a horseman this Amrikan! Did you see they way he guided that horse across the jooie! Amazing! Fearless!” … “He should own this horse”. “I say, not many men can ride such a horse”. Well, in the end I thought better of making the purchase of such a beast. The asking price was more than 100,000 Afghanis. About a thousand dollars at the time. Besides, a horse of this caliber required a caretaker with skills and knowledge of animal husbandry I simply did not possess. I ultimately settled on an old tanga mare at a cost of something like a hundred dollars. I stabled her at the wood seller’s shack across the street from my house. I’d go to the grain market and buy oats for her instead of mere hay or fodder. Together we cris-crossed the Shomali Plain and once, even rode all the way to Paghman with another traveler and camped out at the tree line near the camp of a group of Kuchi herders and massive their dogs. My time as a horseman lasted maybe a couple months when I lost interest and sold the mare to another man, an Afghan, along with a supply of fine oats for good measure. Now and then I’d pass Genghis in the bazaar, him leading a stallion or gelding along on a length of rope. We’d nod and he’d give a wry smile and move along. Knowing I’d bought the tanga mare I suspect he was thinking… “Some horseman, indeed”.